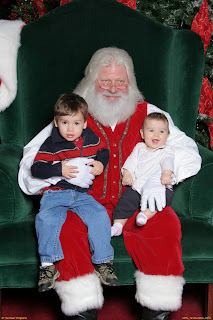 I needed some thing to entertain Troy yesterday, and in a moment of insanity decided to take the kids to the mall to see Santa. I figured it was better to go in the middle of the day during the week, but am not so sure now. I can't believe how many people were there. I'd say it was all the SAHM out with the same idea I had, but the number of dads in the play area tell me otherwise. It wouldn't have been so bad if Santa had more than 1 helper with him. Still, we waited our turn and got our picture. Here's a money saving idea most people probably don't know about... you can actually buy an image on a CD for $24.99. I noticed a lot of people before me buying the $24.99 package that included (1) 5x7 and (4) wallets. The sales woman didn't even give them the CD option. I had to ask for it. Now I can edit and print as many copies as I want. I did find a good buy while I was there. Yesterday I got an e-mail coupon for $15 off a $15 purchase at JC Penny. They had a LOT of kids clothes on sale, and I still needed new pj's for the kids so I picked up 2 pair and paid $3.19 out of pocket. That's right - Retail price was $41 and I paid $2.98+tax = Savings of $40.68. I might try going back today and seeing if I can use it again. It says it can only be used once, but I'm not sure. Might be worth trying. We'll see. Update: It truly was a use once coupon, Bummer! That savings was pretty much wiped out by a splurge buy. I've been looking for personalized stockings, but didn't want to order on-line and pay a fortune on shipping so I figured it was a lost cause. Then I was walking through and found some that just "grabbed" me... I couldn't resist. They were $15 each, which is a little less than what I would have paid on-line. They aren't embroidered, but they are a lot more fun than the traditional stocking. Tim has a Cubs stocking from last year, so we weren't going to match any way. Now I need to keep my eyes open for one that reflects my personality... but I don't think they make a giant coupon. Maybe I'll craft my own later. I have a lot of other savings posts brewing... including warehouse shopping, Walgreen's Wednesday, and my recent Meijer trip. Also, you can now subscribe to my blog - see the link on the side. I know this makes life easier for a lot of people, so I wanted to offer the option. Cute, cute, cute! And, your so smart about using the CD to print your own ... a much better deal. I bookmarked your post on your method to the madness - and am looking forward to your future posts. As I told you on the phone, I basically started shopping Walgreens because of you and am SO glad I have discovered it! It might even win me over CVS since their grocery part is larger and they keep track of rebates, too.